Who could it be. It isn't Maldonado! 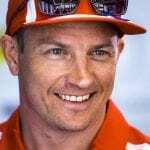 What five drives of F1's most popular driver has Laura Leslie chosen as Kimi Raikkonen's best? Lotus F1 Team are heading to Brands Hatch this Monday, and you can watch, absolutely free of charge! You may not fully understand all the legal arguments (I certainly didn't), but what will come out quite clearly is Smith's sense of wit and humour when it comes to the case and the parties involved. Here then for your amusement are some of the choice quotes.